Mclean, VA. (PRWeb) March 18, 2019 -- Kajeet®, the industry leader for safe, affordable K-12 mobile solutions, announces its expanded Kajeet SmartBus™ offerings, creating a completely Connected Bus for school districts. In addition to filtered school bus Wi-Fi and Global Positioning System (GPS), Kajeet SmartBus solutions now include: Push-to-Talk (PTT), Camera Offload, and Intelligent Sensors. The Kajeet SmartBus solution is used in over 150 school districts across the U.S. and Canada, providing access to six 4G LTE North American wireless carriers. To learn more about the Kajeet SmartBus, please visit http://www.kajeet.net/smartbus. 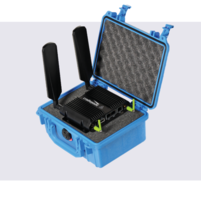 Kajeet, the industry leader for safe, mobile student Internet connectivity, powers the K-12 connected environment. Paving the way for student and teacher success, our secure Kajeet Sentinel® platform centrally manages and enables safe, online connectivity and visibility into learning. Manage student mobile devices anywhere to create an ideal learning environment. Extend the school day with Wi-Fi on the bus and Internet access outside the classroom. From school to home, Kajeet has mobile covered. Kajeet products and services, which operate on six North American wireless carriers, are protected by the following issued U.S. patents: 10,057,300; 10,009,480; 9,237,433; 9,137,389; 9,137,386; 9,125,057; 8,995,952; 8,929,857; 8,918,080; 8,774,755; 8,774,754; 8,755,768; 8,731,517; 8,725,109; 8,712,371; 8,706,079; 8,667,559; 8,644,796; 8,639,216; 8,634,803; 8,634,802; 8,634,801; 8,630,612; 8,611,885; 8,600,348; 8,594,619; 8,588,735; 8,285,249; 8,078,140; 7,945,238; 7,899,438; 7,881,697. Other patents are pending. For more information, please visit us at kajeet.com.